GWR MODIFIED HALL 4-6-0 No.6990 "Witherslack Hall"
The prototype of the Halls was the rebuilding of No. 2925 "Saint Martin' in 1925 with 6'0" diameter wheels instead of the standard 6'8" driving wheels. The first order was for 80 engines of which the first 14 were sent to work the extremely difficult main line through Cornwall, and, by the time F. W. Hawksworth had taken over as Chief Mechanical Engineer of the GWR, 259 Halls were in service. Hawksworth modified the design to use a higher temperature superheat and a further 71 locomotives were built to the modified design. The modifications enabled them to cope with the variable quality of the coal available after the end of the war, and many of them were used almost exclusively on passenger services. As one of the latest engines in the batch turned out of Swindon immediately after Nationalisation, No. 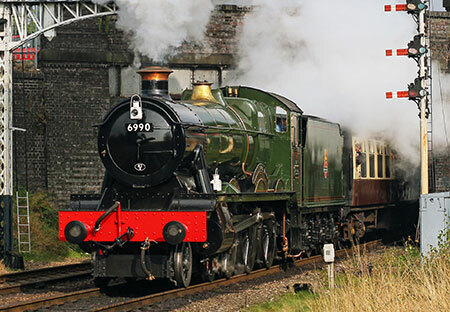 6990 was chosen to take part in the Locomotive Exchanges of 1948. 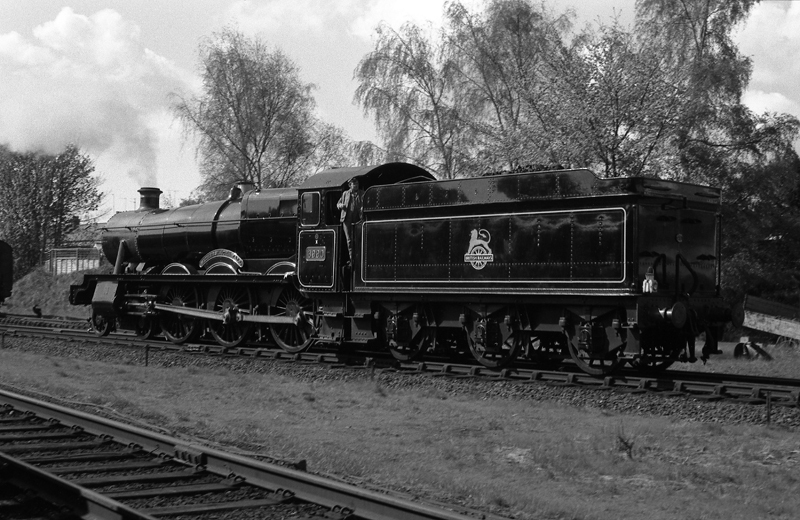 The tender built with 'Witherslack Hall', number 4049 and lettered British Railways was swapped with GWR liveried tender from number 6997 on the 17th April 1948 for the exchanges. Due to clearance problems, the only non-GW route over which the engine could run, was the Great Central from Marylebone to Manchester. 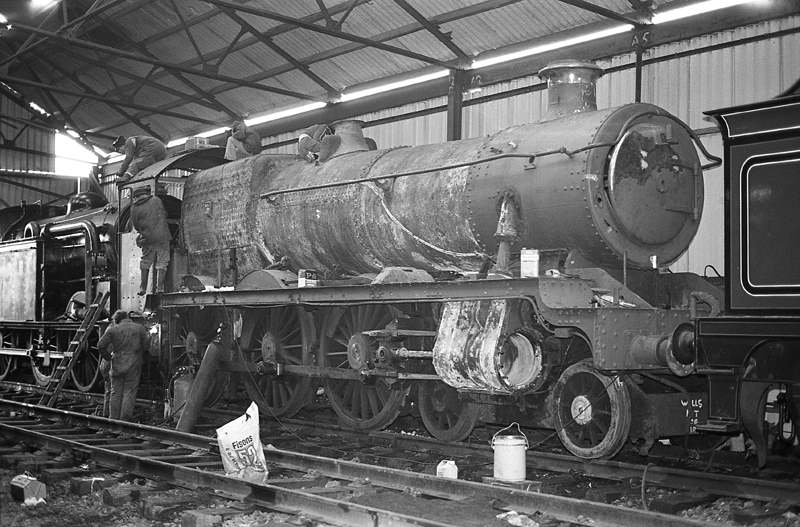 It is quite appropriate, therefore, that it should have been restored at Loughborough. It was also used in the trials between Bristol and Plymouth. In normal service, 6990 was mostly stationed at Old Oak Common, the main GW shed for Paddington, with the exception of a year at Oxford and the last two years when it operated from Bristol. It was used on most of the duties for Old Oak Halls, including one recorded occasion in 1958 when it took a 490 ton load non-stop from Reading to Taunton - 106.9 miles in 114 minutes - on a relief to the 13:30 West of England express, but, in its latter days, it was used particularly on the Worcester services. At one time, the 4.00pm up fromWorcester to Paddington had the fastest booking on the Western Region - from Oxford to Paddington 63.5 miles allowed 60 minutes. No. 6990 was a regular performer on this service and it is on record that the distance was frequently covered in under 56 minutes. At Bristol, it was employed on cross country services from Weymouth and Salisbury to Bristol and South Wales. The first recorded visit of GWR 4-6-0 No.6990 “Witherslack Hall” to the Great Central Railway goes back to the Locomotive Exchanges in 1948, over sixty years ago. Members of the class were no strangers before that as cross country trains were often hauled by the GWR classes as far north as Leicester and Nottingham, having run via Culworth Junction and Banbury. After the nationalisation of the railways in 1948 the newly formed British Railways organised a series of locomotive exchange trials to determine the best features of the locomotives from the previous “Big Four” railway companies. In the Mixed Traffic group were the LMS Black Five the LNER B1, the SR West Country and the GWR Modified Hall No.6990 “Witherslack Hall”. The process was to run each of the types under test conditions on the metals of a foreign railway. In the case of the Hall, trials were to be conducted on the LNER and in particular the GCR section. So in June 1948, No.6990 “Witherslack Hall” visited the GCR and worked the Marylebone to Manchester expresses where it acquitted itself well. No.6990 was designed by F W Hawkesworth and completed in April 1948 at the Great Western Works at Swindon, by then of course, part of British Railways. 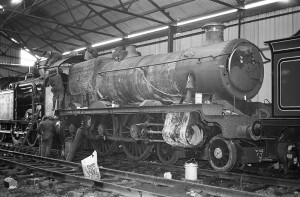 The engine was withdrawn on 17th December 1965 and arrived at Woodham’s scrapyard at Barry in February, 1966. It was then purchased by the Witherslack Hall Locomotive Society and arrived at Quorn & Woodhouse, on the present day GCR, on 29th November, 1975. After a prolonged restoration, No.6990 entered service on 30th August, 1986 and was renamed by David Weston on 8th October of that year. After a successful period of running it was withdrawn for boiler repairs on 8th January, 1992. After these had been completed it again returned to service on 27th January 1996 sporting the BR mixed traffic livery of lined black. After a further period of running it was again withdrawn for a brief period on 8th August, 1999 but returned to traffic in 2000. Continuing boiler problems again led to its withdrawal in 2001 and on 11th October 2001 it went to the Birmingham Railway Museum at Tyseley for a full ten year boiler overhaul. Whilst at Tyseley boiler repairs progressed as funds allowed. During this time the Witherslack Hall Locomotive Society found that, having been involved with No.6990 for more than thirty years, the strains of continuing support were becoming too great. It was felt that to secure the future of the locomotive on the GCR changes had to be made. Discussions with The David Clarke Railway Trust led, in January, 2006, to the Trust taking over the ownership of No.6990. It was very quickly decided that the locomotive would return to the GCR where the boiler repairs would be completed and No.6990 returned to traffic. No.6990 made a welcome return to the GCR on 22nd March, 2006 enabling it to extend its sixty year association with the GCR. The overhaul of the locomotive continues with stays being replaced in the firebox. Witherslack Hall returned to traffic in 2015 and is now in regular service at GCR.